Letters On The Lawn is a great way to celebrate life’s special events and express your sentiments in a BIG way. 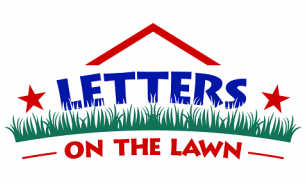 Letters On The Lawn celebration sign rentals are ideal for residences and businesses for any occasion. Give us a call at ﻿903-268-3020 ﻿or 469-338-9275 or Click here to schedule your lawn display today! Letters On The Lawn places your greeting after 7:00 pm the night before your event, and picks them up after 7:00 pm the night of your event. Special set-up and pick-up times can also be arranged when placing your order. We serve the following areas: Rockwall, Royse City, Fate, Caddo Mills, Greenville & surrounding areas. If your area is not listed, please contact us for further information. Click here to schedule your Letters On The Lawn celebration greeting today!